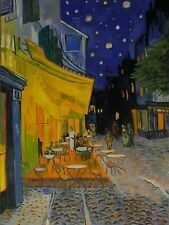 Oil Painting Reproduction of Vincent Van Gogh's "Cafe Terrace at Night" by Laura Pop. Oil on canvas. Canvas size: 24" x 18". "Faux Van Gogh" was painted for a challenge on DPW to paint a border around your painting. I used several of Van Gogh's self portraits in a compilation for this look-alike, and had lots of fun painting it. This is a hand-painted copy of van Gogh's Crows over a Wheatfield, the last painting he ever created. It is 15" x 30" and oil on canvas. 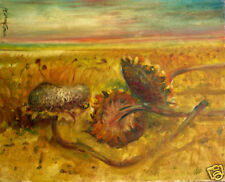 Dried Sunflowers Vincent VanGogh 16" x"20 Oil on canvas Hall Groat Sr. It's painted in brilliant red, gold, violet and green tones and has been photographed in natural light, and adjusted to appear as close as possible to the original. Oil on canvas. 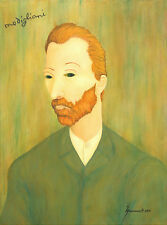 THIS IS MY ORIGINAL COMPOSITION -- I WANTED TO PAINT A PORTRAIT OF VINCENT VAN GOGHAS IF MODIGLIANI HAD PAINTED IT ! TO BE CLEAR: MODIGLIANI DID N O T. THE PORTRAIT, I REALIZED LATER, IS LIFE SIZE. In 1987 one of his paintings won the first place award in the Undergraduate Art Exhibition. He obtained a Bachelor of Fine Arts degree in 1988 with an emphasis in painting. Randal Huiskens Art Shown On National TV. Van Gogh Sunflowers Ode to Vincent Abstract Painting by Linda Stamberger Signed! This I call "Ode to Vincent.". Abstract impressionist painting of Van Gogh's famous Sunflowers in Vase. I signed the vase the way Vincent signed his in original, and my signature is on back of painting, signed and dated!